Fragment of a column of white marble found in 1868 (78 cm high x 35.5 cm diameter). Now in the Historical and Archeological Museum of Kerch, inv. КЛ–1011. 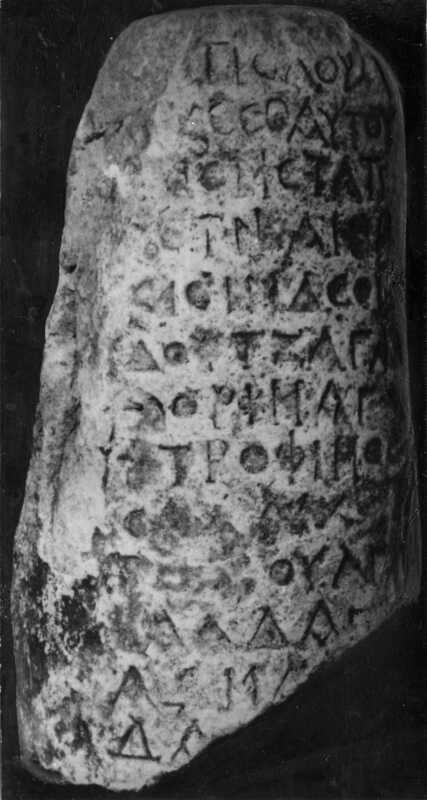 The inscription is identified as Christian based on the presence of two crosses. The most recent publication based on autopsy offers the reconstruction of the occupation as "vine-dressers" (ampelourgoi, lines 1-2). A previous suggestion was "patrolling officers" (peripoloi, SEG 52 , no. 739). 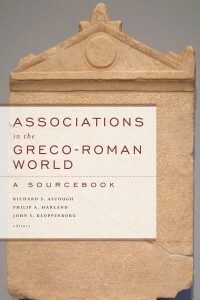 Members of Christian monastic groups could identify themselves as society-members, thiasitai (e.g., Bandy, Greek Christian Inscriptions of Crete, pp.116-117 [no. 88]). The reference to a common profession of the members suggests a guild, though it may be metaphorical (cf. Luke 13:6-9). The two crosses might serve to distinguish as Christian Sauagas (prefect) and Trophimos (the only name attested as Christian elsewhere at this time in this region) from the other society members. If so, then this was a group that included both Christians and non-Christians (cf. Cyprian, Letter 67.6 [mid III CE]). Lord, honour your vine-dressers (ampelourgoi). Save them and remember me with the holy ones. Health! . . . During the 7th (?) . . . year and in the month of Xanthikos…. The fellow society members (syntheiaseitai) are: Doutzagas, ☩ prefect (komēs) Sauagas, Thorimag, Dappaeis, ☩ Trophimos, Omar, Saldich (? ), Midach, Toboulagaeis (? ), Attasis, Aldag, Kanditzis, Adamtzis (? ), Seurag, and Name. . . Amen. [ἀ]μπελου[ργούς σ]ου σέπτα̣[σον?, κ(ύρι)ε,] |(καὶ) ζε̣̣͂σο αὐτοὺς καὶ μνημ[όνευε|ἐ]μ̣ὲ μετὰ τῶν ἁγίων· ὑγ̣[ία. |.ψ]´ ἔτι κ̣αὶ | μηνεὶ Ξανθικ[ῷ ..]´. ||	Εἰσὶν δὲ οἱ συνθειασεῖτα̣[ι]· |Δουτζαγας,☩ Σαυαγας κόμ̣(ης), |Θ̣οριμαγ, Δαππαεις, |☩Τρόφιμος, Ομαρ, | Σα.λ̣ιχ, Μιδαχ, || .ο̣β̣ουλγαεις, Αττασις, |Αλδαγ, Κ̣α̣νδιτζις, |Αδμα..[τ]ζις, Σευραγ, |Δα..., [ἀμ]ή̣ν.